A new headteacher has been formally appointed at a Corby school during one of the most turbulent periods in its history. Robert Sloan has taken the helm at Lodge Park Academy as it was confirmed that previous headteacher Meena Wood had officially left the school following a period of absence for personal reasons. Mr Sloan becomes the seventh headteacher at the school since 2012. 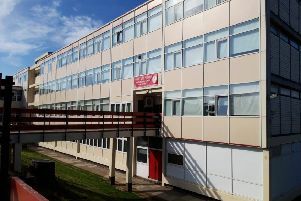 Lodge Park, the oldest existing secondary school in Corby, had only three headteachers between opening in 1964 and 2012 - when the county council stepped in to run it after Ofsted raised concerns. Mr Sloan had been acting as interim head at Lodge Park since before Christmas. The Shetland Way school has been told at several previous Ofsted visits that it requires improvement and a report drawn up by inspectors who visited last month has not yet been published. The school is run by the David Ross Education Trust, which was last year said by the Education and Skills Agency to be financially vulnerable following a series of high-profile resignations including that of its chairman, former education secretary David Blunkett. School bosses sent a message to parents at the school to tell them of the resignation of Meena Wood and thanked her for her contribution. A school spokesman told the Northants Telegraph: “Earlier in January we informed parents that Mr Robert Sloan had been appointed Lodge Park Academy’s Executive Principal on a permanent basis.